This is a one-week workshop for California Indians who wish to find and use the materials on their languages that are held in the archives of the University of California at Berkeley. Archivists at the three main language archives - The Bancroft Library, the Hearst Museum, and the Survey of California and Other Indian Languages - are on hand to help you access the materials you need, and linguistics graduate students and professors will work with you to help you interpret and find ways to use these materials for your own research, learning and teaching purposes. Lectures and mini-workshops are also provided on linguistics, language teaching and learning, and use of the increasing amount of on-line materials. APPLICATION DEADLINE: You must register by April 15, 2014. We are looking for faculty and grad students who could mentor our participants, who will be studying basic articulatory linguistics and grammatical analysis at the workshop, or, if they have come before, will work at a more advanced level to learn more about the structure of their language. 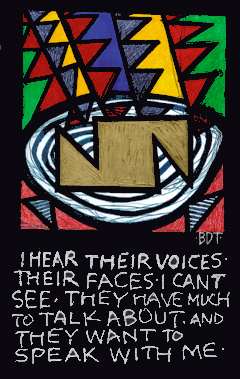 Spoken word is a way to express feelings, ideas, thoughts and visions through song and poetry. Far too often, Indian languages lack venues where we as Native people are able to use our Native languages to express our stories and experiences. AICLS, in partnership with News from Native California and Heyday, would like to invite you to an evening of stories, poetry, and song shared in languages indigenous to California. It will truly be a special evening. A night of the oldest languages of this land being spoken and sung in a modern setting, a shining testament to our ongoing presence, as we speak and sing of issues dear to our hearts. Maidu rock band, Chochenyo Poetry, Miner lettuce salads, acorn, manzanita cider, dark lights, native language, good people. What more can you ask for? Please join us and express yourself using an Indigenous California language at our first event March 28th at 6pm. "Language and culture cannot be separated. Language is vital to understanding our unique cultural perspectives. Language is a tool that is used to explore and experience our cultures and the perspectives that are embedded in our cultures." 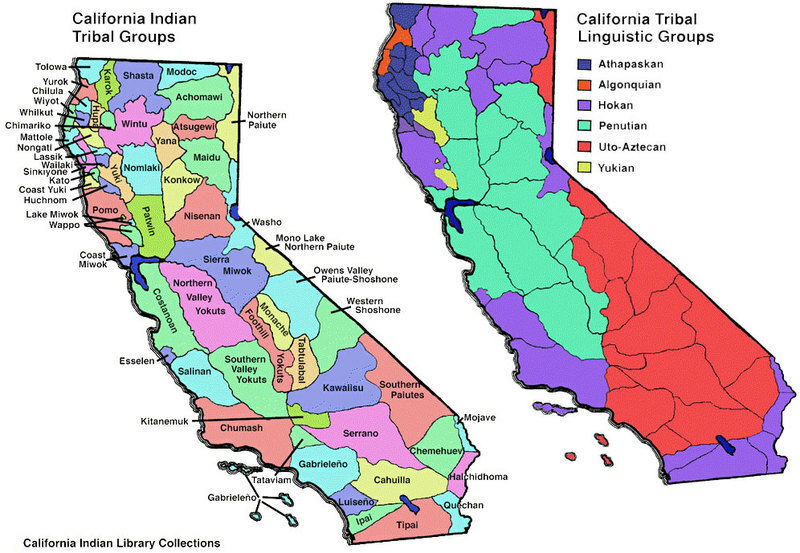 Donating to the Advocates gives a vested interest in the revitalization of California's languages and cultures. Please send donations to the Advocates, 221 Idora Avenue, Vallejo CA 94591.You can also make donations through our web site at aicls.org. Thank you for joining the Advocates. Your contributions are tax deductible. This past week, I read a couple of different articles suggesting that one way to address several of these factors is to teach indigenous languages in schools. 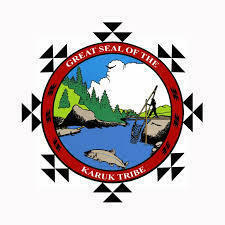 With many AI/AN students feeling as if they are actively being pushed out of school, offering indigenous language classes or language immersion programs can help pull students back in. As many of us have experienced first-hand, having just one class that we really enjoy can make the school day bearable, even enjoyable. It makes sense that students who feel welcomed and are engaged by their classes have higher attendance rates than those who don’t. It also stands to reason that when students are offered classes that are tailored to their needs they are more likely to complete assignments, get better grades, and feel more invested in the educational system overall. However, with funding in many school systems stretched thin, it’s often difficult to convince those holding the purse strings that language instruction is necessary. Parents, including AI/AN parents, are often divided over whether or not language instruction should be a priority when there are so many other needs to be met. While I personally can see both sides of the argument, stories like the one of California State University student Michael Murphy make me believe that schools must make language classes, culturally-appropriate curriculum, and culturally sensitive teaching methods a priority. Murphy, a member of the Pauma Band of Luiseño Indians, says he would have dropped out his first semester had it not been for his involvement in the American Indian Student Alliance. Now a sophomore, Murphy is involved in a project blogged about, creating interactive Luiseño language lessons to be loaded onto Nintendo-compatible game cartridges. It’s sad to think that other students like Murphy are disappearing from our high-schools and universities because they are not given the support they need. 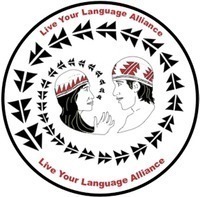 Language classes: Chinuk Wawa, Ichishkíin, Tolowa Dee-ni’, Choctaw, Lushootseed, and Nez Perce. Teaching Methods: Home Based Teaching & Learning, Early Childhood & Elementary Classroom Teaching, & Middle School through Adult Teaching. High School Cohort Program: High School program's core classes: language, linguistics, and teaching methods and materials development. Students will design and create activities to support their learning and teaching. Students will have other activities at NILI and on campus. Scholarships are available to assist with tuition costs only; the scholarship application is available on our website. 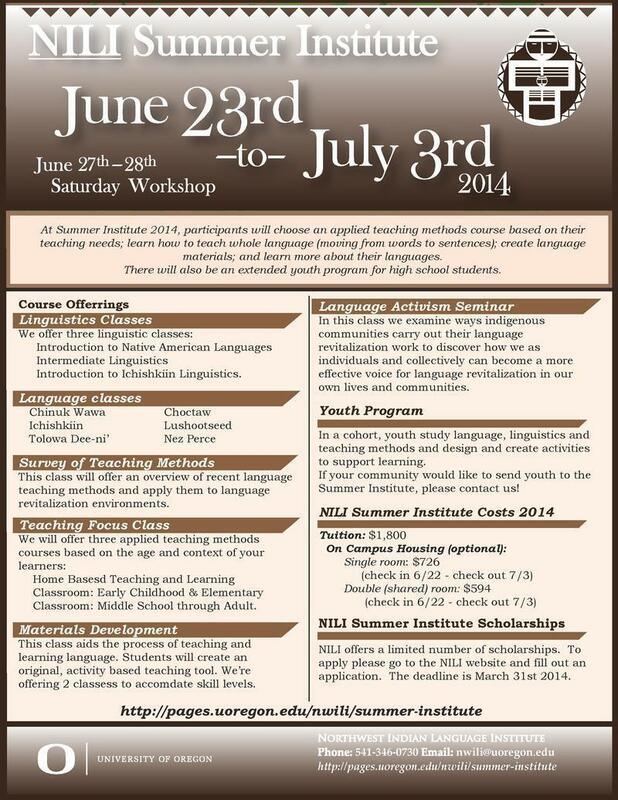 To find registration forms, scholarship application, or for more information, please go to http://pages.uoregon.edu/nwili/summer-institute and see the attached flyer. Kawaiisu Language & Cultural Center "Nuwa, without our language , who are we?"